WR Group, one of the country’s leading global wellness companies, is pleased to announce that its innovative FOLIGAIN® hair care collection is now available in select H-E-B stores across San Antonio and Houston, Texas. 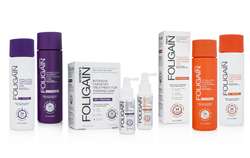 FOLIGAIN is a next generation hair care line dedicated to providing high-performance formulas to the millions of men and women looking to improve their hair health. Fusing the latest science and industry trends with clinically proven ingredients, Foligain’s mission is to develop effective, transformative solutions for younger-looking, fuller-looking hair. Each product in the Foligain line is thoughtfully designed with the needs of consumers hair goals in mind, and the lightweight, refreshing formulas deliver trustworthy, visible results. “We strive to offer affordable hair care solutions to consumers looking to improve their hair & scalp health and want to make it as simple and convenient for them to do so,” says Barch-Niles. Recently named a 2019 delicious living award winner, FOLIGAIN contains a ground-breaking, new triple action hair health complex called TrioxidilTM, a hair care formula equipped with bioactive ingredients clinically shown to help revitalize hair and scalp health. Developed to infuse hair and scalp with key nutrients and botanicals for healthier-looking, thicker-looking hair, Trioxidil is enhanced with moisture-lock technology to seal in the formula’s key ingredients and retain skin moisture. The Foligain collection ranges in prices range from $19.99 – $49.99. For more information, please visit Foligain.com. About WR Group: WR Group is one of the world’s fastest growing global manufacturers and distributors of high-end health and personal care products. Its extensive brand portfolio includes nearly 900 products, which are distributed to more than 60 countries worldwide. WR Group, based in Scottsdale, AZ., has an active consumer base of over 2 million customers that have grown to become loyal, repeat purchasers. Since 2001, WR Group has been a leader in the health and wellness industry. WR Group has designed 16 uniquely high-quality brands with a focus on delivering the cleanest, most effective products available for families including Foligain®, Probiogen™, ORALGEN NuPearl®, BareOrganics™ and more. About H-E-B: H-E-B, with sales of $26 billion, operates 400 stores in Texas and Mexico. Known for its innovation and community service, H-E-B celebrates its 114th anniversary this year. Recognized for its fresh food, quality products, convenient services, and a commitment to environmental responsibility and sustainability, H-E-B strives to provide the best customer experience and lowest prices. Based in San Antonio, H-E-B employs over 110,000 Partners in Texas and Mexico and serves millions of customers in more than 300 communities. For more information, visit HEB.com and HEB.com/newsroom.